Why a Salad Dressing for Iguanas Easy to apply supplement that consumers will understand right away. Added bonus is it is easy to apply to an iguana's green mixes, making even dry foods delicious. Targeted formula that consumers have been asking for that tackle the issues for iguanas, namely a supplement that is designed specifically for iguanas. 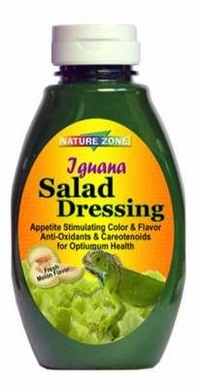 Guaranteed to stimulate appetite, enhance the specific iguana's coloring and enjoyment at feeding time with delicious melon flavoring. Supplies Anti-Oxidants, Carotenoids with a specific variety of vitamins and minerals for optimum heath in captivity for iguanas. Why the Salad Dress is especially nutritious for Bearded Dragons Soluble fiber has been added for the Bearded Dragon's digestive health. Adds micro nutrients, minerals, vitamins help guarantee the balanced nutrition of any salad mix. Adds phytonutrients (carotenoids, anthocyanidins, flavonoids) and found in various berries and flowers. Which help maintain natural colors in the Bearded Dragon's physical appearance.